On the edit page of your quiz, in the integrations section, flip the switch below the ConvertKit icon and select the form(s) you want to send the leads to. We also support Segmentation, which allows you to send the leads to differents forms according to rules you defined. 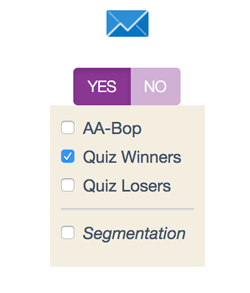 From then on, all leads collected in your quiz will be sent directly to the form(s) you selected. If you have never heard of it: All the major email marketing companies are generic. From cupcake shops, to design agencies, to plumbing companies, they are trying to serve every type of business. Instead of a perfect-for-you solution you wind up with a mass of features that aren’t a good fit for anyone, especially not bloggers. So we set out to build something simple, something elegant, something built for bloggers&mldr; a tool that makes it easy and obvious to grow your business through email marketing. Think of ConvertKit as best practices by default.